Red is one of the rarest colors in the gems world, and a pure red, such as the famed pigeon's blood ruby, is exceptionally rare. Most red gems have a secondary hue, such as orangey-red (spinel, mexican opal), pink-red (spinel, rhodolite garnet), brownish-red (almandine garnet, red zircon) or purplish-red (rhodolite garnet, rubellite tourmaline). Pure red gems in large sizes are even rarer. A fine ruby over 5 carats is extremely rare (and extremely expensive). So any high quality red gem in a large size counts as very special. Rubellite, like emerald, typically have natural inclusions. So long as the inclusions do not make the gem appear milky or cloudy, they do not affect the value of a finely-colored stone. A Rubellite graded "eye clean" counts as a very clean specimen. The leading sources for high quality rubellite are the main tourmaline producers: Brazil, Madagascar, Mozambique, Nigeria and Pakistan. We have found some exceptional Rubellites from Nigeria and Mozambique in recent years, but true reds are always hard to find and are sought after by collectors. This month we feature fine Tourmalines from our collection, including two superb Rubellites from our recent acquisitions. Click on any photo to view the details for the gem. A very rare Red Rubellite Tourmaline over 20 carats! This impressive gem has outstanding color and full fire, and has been custom cut from an old stockpile of top Nigerian rough into an elegant square cushion cut. Clean Rubellites in a pure red are extremely rare in this size. This is a wonderful stone for the rare gem collector. Guaranteed natural and untreated. A splendid large Chrome Tourmaline in the classic deep emerald green color. Very clean and beautifully fashioned in a subtle heart shape. This fine gem will set up beautifully with diamonds in a pendant or ring. Guaranteed natural and untreated by AJS Gems, Bangkok. Yellow is one of the rarest of all tourmaline colors, with colors ranging from canary to gold, usually with just a touch of green. Most yellow tourmaline have significant inclusions. But the vivid color and excellent brilliance make this a popular gem with collectors of rare stones. This trillion is notable for its pure yellow hue and very good clarity. Guaranteed natural and untreated. A marvelous large Bi-Color Tourmaline with lovely colors grading from green to red. This is beautiful material which has been expertly cut into a fine step-cut rectangle with a smooth lustrous finish. This fine gem is ready to be set in your custom jewelry design. Guaranteed natural and untreated. A rare blue-green Paraiba Tourmaline from Mozambique. This unusual gem has an intense saturation and is certified by GIA as containing traces of copper and manganese ("may be called 'paraiba tourmaline' in the trade"). A rare gem for the tourmaline collector. Guaranteed natural and untreated. A gorgeous Rubellite heart in a large size! Pure red is one of the rarest colors in the gem world, and very hard to find in Rubellite. This lovely gem has outstanding open color and full fire, with very good clarity for this variety. This is a wonderful jewelry stone for someone you love. Guaranteed natural and untreated. Is Hawaii's Kilauea Volcano Raining Gemstones? Hawaii's Kilauea volcano has been erupting actively for more than 2 months and recently there have been reports in the press that the volcano is literally raining gemstones. First reported by sciencealert.com, Hawaii residents described finding small green crystals that have fallen out of the sky during Kilauea's eruption. The crystals have been identified as the mineral olivine, known in its gem-quality form as Peridot. The crystals are indeed of volcanic origin, but geologists have concluded that they are not in fact from the current eruption. Magnesium iron silicate is one of the most common minerals in the earth's mantle. When volcano eruptions spray magma high into the air, the high crystallisation temperatures of magnesium iron silicates allow them to transform into bits of olivine, which are then encased in chunks of lava. However, the shiny green crystals found on the ground throughout the Big Island are not from the current eruption. These crystals are the result of a long weathering process where olivine is eroded out of the volcanic landscape. 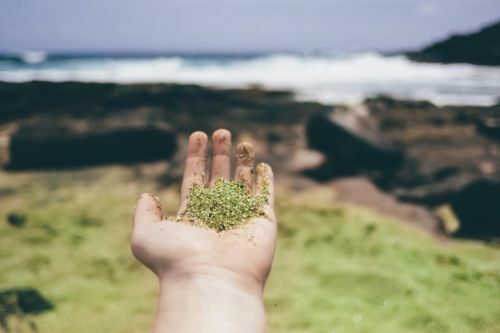 Hawaii's Papakolea Beach is famous for its unusual green sand, formed from tiny olivine crystals. But don't get too excited about finding gem-quality Peridots on the ground in Hawaii. The olivine crystals there are almost always small and broken. Large transparent olivine crystals are very rare, and that's why Peridot is a valuable gemstone. Thanks for the compliment on our gem photos. We've been photographing gemstones for more than 20 years, and we like to think that we've learned some lessons over the years. We take all our gem photos under lighting that emulates natural light at midday. These lights have a "temperature" of 5000 Kelvin, which means they are well balanced, favoring neither the red nor the blue ends of the spectrum. It is important to illuminate the gem sufficiently to make any inclusions visible. But we are also careful not to overexpose our photos, since a frequent source of disappointment for gem buyers is that the actual gem appears darker than the photos. We use neutral backgrounds and avoid the hokey staged backgrounds that some dealers use to distract attention from the gemstone. Last but not least, one of the keys to taking a beautiful gem photo is to start with a beautiful gemstone. Fine gems are easier to photograph than commercial quality stones, and we are not being modest when we say that our beautiful gem photos are really a product of the beautiful gems we sell.